Just landed your first full-time job after college? Even if you’re on a decent salary, you can still end up in debt or with little to show for it. From new clothes to high-tech gadgets, it can be tempting to blow your hard-earned cash. But if you manage your money well and learn how to save money, you can set yourself up for a bright future. Check out our 6 money saving tips to get started! Creating a budget and sticking to it might seem like a no-brainer. But you’d be surprised at the amount of people who don’t know how to budget money on a weekly or monthly basis. If you don’t know what’s coming in and what’s going out, it makes it that much harder to save money. Deduct fixed expenses from your net pay and the balance is yours to spend and save. A good rule of thumb is to try and save 30% of your paycheck and set up an automatic payment so you won’t even miss it. This percentage can be adjusted if you feel it’s too much. Remember that you’ll want to have some money to use for fun stuff like going out to dinner and entertainment and other variable expenses. If you deprive yourself too much you may be tempted to dip into your savings. Do pay off any credit card debt or personal loans as quickly as possible. These loans will have high interest rates and you could be saving the cash you’re using to pay them off. 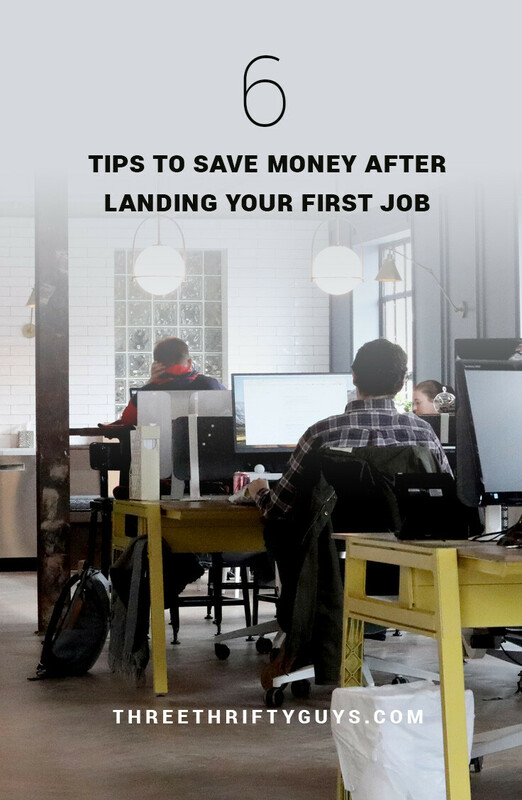 It can also be tempting to hit the shops once you land your first job, but it’s better to stop using your credit cards altogether and limit the amount of debt that you take on from here on out and try to pay cash for everything that you need. Creating a financial buffer or emergency fund is one of the most important money saving tips. If you have an unexpected medical bill or car expense then you have the money there to pay for it. Otherwise you’d need to use your credit card and incur debt again. Emergency savings should definitely be factored into your 30% savings goal, even if it’s a small amount each week or month. Aim for at least three to six months’ worth of savings in your emergency fund to safely tide you over, and keep it topped up every time you use it. If your new job has an employer-sponsored 401(k) retirement plan, then you can save money even better with this set up. The money will come out of your gross pay, so you won’t even need to count it as part of your fixed expenses. Try to match what your employer is contributing so you’re getting the best bang for your buck. The earlier you start saving for retirement, the more time your funds will have to grow. If you’re looking for more ways on how to save money each month, take a look at what you’re paying for housing. Rent can make up a sizeable proportion of your fixed expenses depending on the city or area where you live. To cut back on rent costs, look at moving to a cheaper neighborhood or consider living with a roommate or two – sharing utilities will save you even more money. Once you’ve moved, be sure to stick to the same budget so you can save the extra rent money or increase your retirement contributions. Whether you want to buy a car, own a home or invest in shares in the future, take the time to set financial goals each year and mark your progress. If you’re not sure how to go about reaching a certain goal, then enlist the help of financial advisor or do some online research so that you know what’s involved, and you’re ready when the time comes to make your next move. With set goals and a budgeting plan in place to reach them, you’ll be on the right track to save money and build wealth throughout your life. What Would You Do With a Guaranteed 5 Years of Basic Income (No Strings Attached)? Should You Discuss Your Salary With Coworkers, Friends, and Family? i am always prefer to share rooms with others and save money. This is such a experience tip. Great ideas! I especially enjoy having a budget and the freedom it can bring. Yes to roommates! I refused to live with anyone right after school and had to pick up the tab on my $600 rent solo. That’s cheap by most standards, but I had a low-paying job that made buying groceries a challenge, let alone rent. Find ways to have fun on the cheap right now! As you earn more, remember to keep life simple. You’re right, having roommates is a great way to save money. Have lived with (at most) 4 at one time – which really made things affordable!